You guys know I'm a big fan of pressing pillows. They are super important for getting the best possible pressure when applying heat transfer vinyl with a heat press. The problem is...heat press pillows are not cheap. But they are relatively inexpensive to make! Each teflon pillow can set you back anywhere from $10-$15 if you buy them individually. Having various sizes on hand is ideal - but a set of pressing pillows can cost nearly $70. 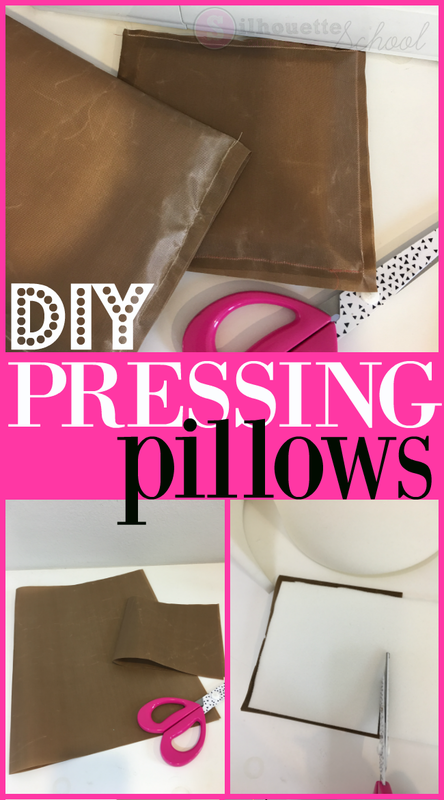 There is some good news though and that is you can make heat press pillows pretty easily and for a lot less money. To make DIY pressing pillows you need two things: teflon sheets and half inch high density foam. This is the 5 pack of 16x24" telfon sheets I purchased. I picked this set because of the large size of the the sheets and the price - under $10! These supplies will cost you about $30 and allow you to make 4 or 5 pillows depending on the size pillows you decide to make - so definitely a savings! Pressing pillows come in various sizes - usually 5 x 5", 9" x 9" or 12" x 12" and 15x15. The measurements don't need to be exact you just want a small, medium, and large option so you can use them depending the size of your surface. For example the smallest size is best for baby clothes, while the largest is ideal for adult shirts. Let's focus on the small size because once you get the hang of it, you can make various larger sizes the same way. Take one of the full teflon sheets from the pack and lay it out flat. Fold it lengthwise with the long ends together and crease the fold. Measure about 7" in from one of the short ends. Cut a straight line across. you sew them though you want to cut a piece of foam down to size. Trim off a piece of foam from the larger roll and lay it down on top of the pressing pillow cover you cut. You want to cut the foam so it's at least .75" inch smaller than teflon piece on the three sides you need to sew. Once the foam is cut, keep it to the side while you sew TWO of the sides of the teflon cover closed. A simple straight stitch is fine. I'm telling you - if I can do this, you can too! Keep the third side open so you can slide the foam in before you sew it closed. Sew up the final open side...and you're done with your first pressing pillow! Repeat the steps making various size pillows. To make the largest heat press pillow, you likely won't be able to take advantage of the fold...but you can sew together two full teflon sheets to get a 15" x 15" pressing pillow! Not clear of the benefits of pressing pillows or how to use them? Check out this Silhouette blog post on how and why heat press pillows are so important.